Folding and unfolding is widespread in nature, from chains of amino acids that twist into complex proteins to blooming flowers that unfurl. Yet the strategy is uncommon in engineering and manufacturing, even though it carries certain advantages. “Folding allows you to avoid the ‘nuts and bolts’ assembly approaches typically used for robots,” said Rob Wood, an engineer at Harvard and the study’s senior author, in a press release. The scientists who built this prototype say folding robots can be built faster and with less inexpensive tools using the origami approach than with ordinary manufacturing or with 3D printing, which is still too slow for mass production. To design the origami robot, the researchers used an algorithm they had previously developed that calculates how to create any shape from a flat sheet of material. The free software version of it is called Origamizer. Then the researchers used a laser cutter to slice layers of paper, etched copper, and Shrinky Dinks (a children’s toy and polymer that folds when heated to 212 degrees Fahrenheit) to specification. They made a sandwich of sorts from the layers: copper circuitry in the middle, then paper, and finally the Shrinky Dink on the outside. To this flat sheet, the researchers added two motors, two batteries and a microcontroller that controlled the robot’s circuits. In sum, the materials for the robot cost $100. Ten seconds after the engineers add the batteries to the robot, the microcontroller tells specific copper circuits located in the sheet’s joints to warm up. The copper warms the polymer enough to change its shape. The final shape depends on where the hinges are and the order in which the hinges are activated. Once the joints have cooled, the polymer hardens, and the microcontroller commands the motors to begin moving the robot’s legs. 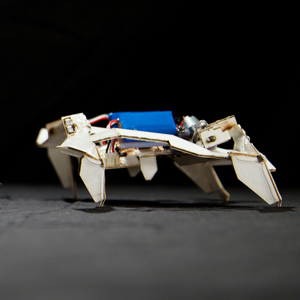 The robot crawls away at a speed of over 2 inches per second. The whole process requires quite a bit of energy for what it does—around 2000 milli-Amp hours, which is the same amount of energy that’s stored in one alkaline AA battery. “Getting a robot to assemble itself autonomously and actually perform a function has been a milestone we’ve been chasing for many years,” Wood said in a press release. In the past, the team created an inchworm robot and a self-folding lamp, but both needed human intervention to work. It wasn’t an easy process—this prototype worked after 40 other versions before it had failed. The high heat from the copper circuits often burned the robots before they could finish folding. Another problem: Right now, the robots can’t fold back to their original shape, so the scientists will be investigating new ways for the material to fold. They’ll also be researching ways to scale up the robot, which will require stronger materials. One of the major benefits of this kind of technology would be robots that could be shipped flat and assembled on site. “Imagine a ream of dozens of robotic satellites sandwiched together so that they could be sent up to space and then assemble themselves remotely once they get there–they could take images, collect data, and more,” said lead author Sam Felton in a press release. The robots could be deployed in search-and-rescue situations such as a building collapse, where they could slip through tight spaces and then fold into a functional shape. Because the design tools like Origamizer already exist and the equipment and materials required to build these robots are relatively inexpensive, the researchers believe this cheap and quick design technology could change the way we build complex machines. At a press conference, collaborator Daniela Rus from MIT said she imagines a future in which customers can visit a robot store with a particular use in mind, such as a robotic chess player or a robot playmate for a lonely cat at home, and pick up the machine 24 hours later.